The two Pinta toolbars are excessively big under Linux, whereas in Windows and Mac OS X they have a decent size. The big toolbars makes Pinta nearly unusable when you're working with a netbook. I had the same problem few months ago, but I think it was some setting in Ubuntu - like using big toolbar buttons. This problem now disappeared. Can you please write what is your Linux distribution and version, what is the desktop UI (Gnome, KDE etc). What is your Pinta version? 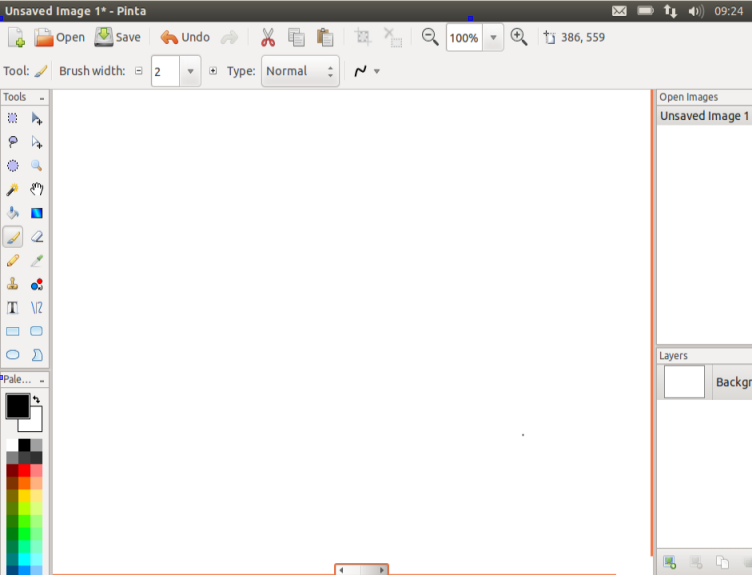 I am attaching print-screen Pinta 1.1 from PPA on Ubuntu 11.10. Can you please attach pint-screen of your screen, to see what is missing. This bug report doesn't mention cutting off, so I'll leave it open for now. Screenshots would be nice. grofaty, my Pinta shows exactly like yours, I use GNOME. What I'm referring to is, that Linux's Pinta uses big 32×32 icons, and Mac & Windows versions of Pinta uses 16×16 icons. The Linux version uses the same icon size as all other GTK/GNOME applications. It's not a bug. Change your icon size in system settings, and Pinta's will change too. @sikon: Thanks for the clarification! Anyway, I think this should be consistent with the other Pinta icons (those that aren't picked from the system, ie. hardcoded) that hava a 16×16 resolution and look bad because are scaled up. For example, look at the ‘Crop to selection’ icon; it is scaled to fit the other 32×32 icons. That looks bad. fitoschido, ah sorry, I just assumed big icons are troubled to cut of UI (like it was already reported). If I understand the problem is to have the same feel and look on all systems (Windows, Linux and OS X). In Ubuntu (see picture at #1) also "Palette" string is not visible, but it is perfectly visible on Windows. I think this bug report should be market as wishlist. I disagree, because this is a flaw in an existing feature (the toolbar icons) and not a request for a new feature. But consider forcing the toolbars to be small by default, because this helps to save space in netbooks and it's consistent with the ‘Tools’ pad, that always has 16×16 icons. Forcing to have small toolbar would produce inconsistency in whole Ubuntu look & feel. Actually on my wide screen PC I don't like to have small icons. So that is why I have asked a question on Answers a year ago, how to get the same look for Pinta on Windows. 2. according to screen resolution set the small/big icons. or maybe do the both. > Maintainers, which is subscribed to Pinta. > Pinta nearly unusable when you're working with a netbook. I really want to narrow the toolbars, so I'm assigning this bug to myself. I managed to reduce the height of the second toolbar (Tools) to an adequate size (saving 10 pixels!). I didn't reduced the height of the main toolbar to avoid removing the large icons. Now the UI looks a bit more streamlined. I'll change this bug's title back to reflect the original issue reported, and set it to fixed. We'll track the *other* issue (not having a 32×32 version of some icons) in another Launchpad ticket.